LottoHoy is a lottery platform that will allow you to play international lotteries from different countries with the highest jackpots and the best odds. You can play through any system, iOS or Android, and with any mobile device, tablet or desktop computer. Initially offers English, Spanish and Russian languages. LottoHoy.com provides an intermediary service in the purchase of lottery tickets. The player grants a purchase order to the agent who makes the purchase on his behalf at the official authorized point in the town and country where the draw is organized. LottoHoy offers to the players various lotteries worldwide, choosing those that by their characteristics and volume of awards can guarantee the best results and the most spectacular jackpots. The american PowerBall and MegaMillions. 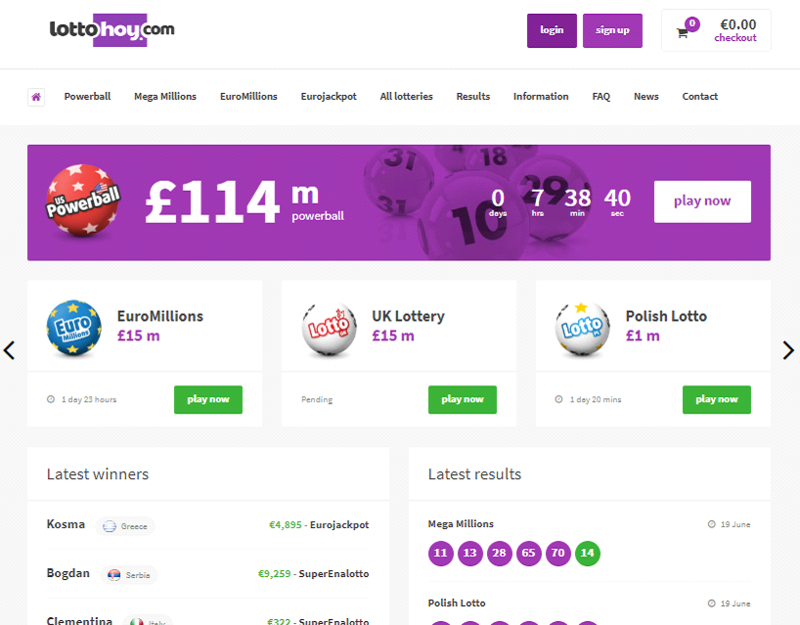 On the main page you can see the available jackpots in the different lotteries and the closest draws, from where you can access each of the lottery pages. In addition, you can see the results of the latest lottery draws, as well as a list of some of the latest winners. Once in the game page, several columns or lines are shown. There you can choose the combination you want to play. (This option is also available with the quick pick feature). The player can play a single column or as many as he wants, LottoHoy does not force the purchase of lots of bets or pack of draws. A very interesting question and to take into account, is that the prices of the lottery tickets offered are probably the lowest compared to other companies with similar characteristics. Players who come to the Lottohoy.com platform for the first time (or not), can be confident that their personal and financial data will be perfectly guarded, since security is guaranteed in all telematic operations. The platform has implemented security protocols with 256-bit A + SSL Certificates to protect the exchange of electronic information. To answer standard questions, the platform has a FAQ service with answers to the most frequently asked questions about the company, the services it offers and the mechanics of the system. Likewise, it offers customers and interested parties a contact service through a form on the platform itself, a direct email address 24/7, and a chat service.